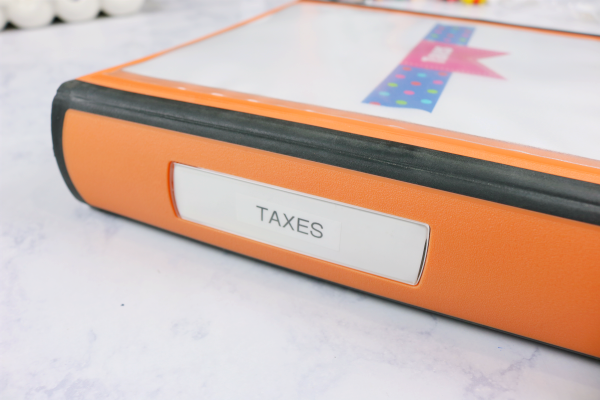 The following is a guest post about how to easily organize tax documents for quick reference from regular contributor, Kristin at The Gold Project. It seems like once the holiday season is over and the new year has begun, it is time to start thinking about taxes. In my house, it usually includes printing off and collecting many different documents to turn in to our Accountant. This task used to be a very confusing one for me. That is until I came up with a system that runs pretty smoothly and makes life so much easier at tax time. 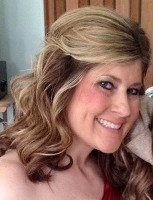 So, I thought I would share it with you today. The first and most important organization piece for my taxes is my binder. 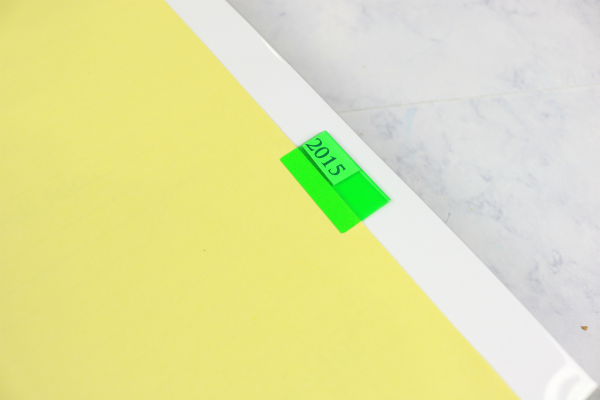 All of our tax documents are contained in this one binder that is sectioned off and labeled by year. Right now, I have eight years worth of taxes in this binder. I know they tell you to keep seven years, but I had an extra tab, so we keep eight instead. When the new tax season rolls around, we shred the oldest year to make room for the new paperwork. 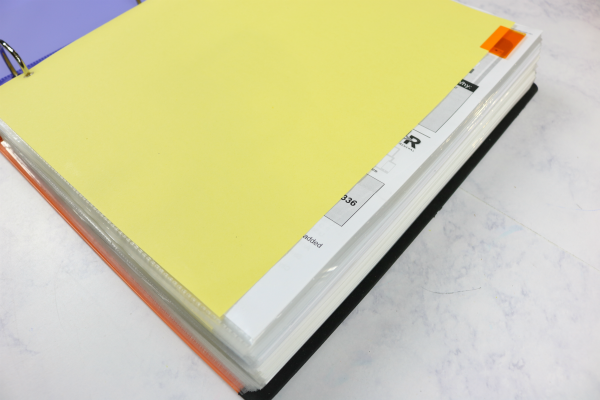 The most important document in this binder is The Annual Tax Documents Checklist that I created. This document gets printed out every year. Feel free to download a copy for your tax binder. This document is always the first page in a dated section. This paper is very beneficial when getting tax documents ready to turn in. I will pull out last year’s completed sheet and I will gather those same documents (and, any additional ones) for the current year. As I am gathering them, I will fill out a new sheet for the current year. This document makes my life so much easier when getting ready for tax time. 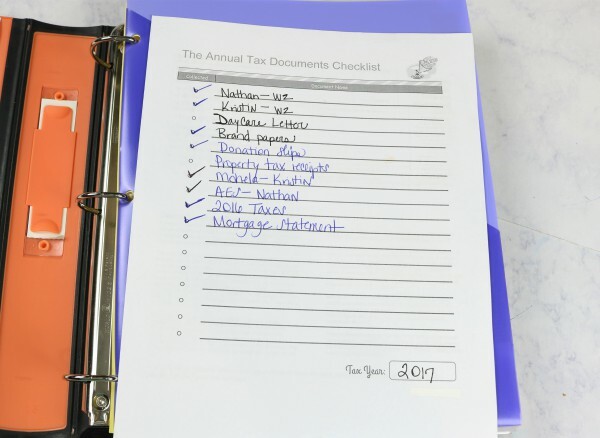 Keeping my tax documents in a binder and having a main checklist may seem like simple tasks, but they have made a tremendous difference in how we organize and collect documents for our yearly taxes. 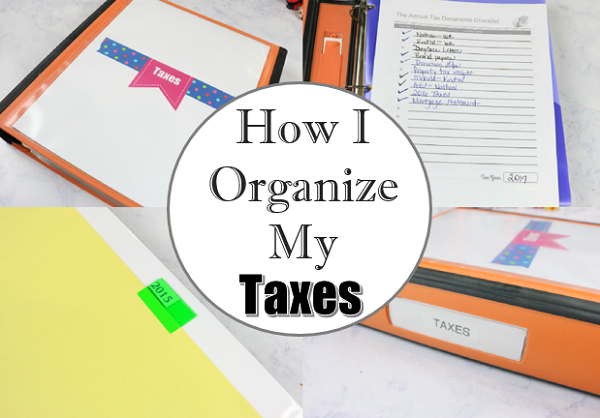 How do you organize tax documents? 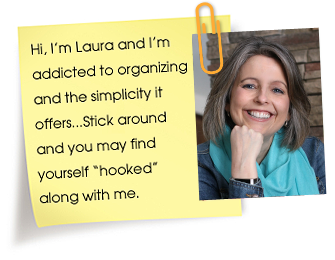 Note from Laura: this is exactly how I organize tax documents in my house too. However I use a separate binder for each year. This simple method makes it so easy to find what I need for quick and easy reference. Great idea. 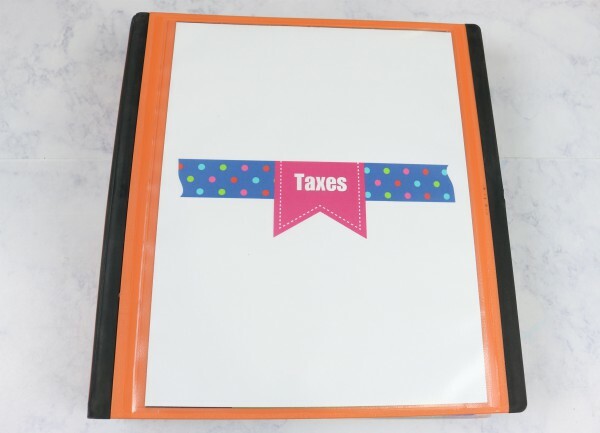 Of course all the taxes should be in one binder. DUH!! I feel like all my stuff won’t fit into a binder. I have them in larger file pockets by years and in a bin in the basement. Maybe I’m keeping too many papers??? I started using a modified version of your tax notebook a couple of years ago. It is so much better than a shoebox full of receipts! Thanks for sharing this with us. This would work well if one only has a few papers for taxes. I am an accountant – have been since I was 12 and starting helping my dad. I know I get too many papers to keep – not only 1099s and similar, but bills proving business expenses for my husband and myself, as well as other deductible items. I have a boxes I use in a similar manner, one each for 9 years. 7 years is the requirement from IRS to keep records, generally accountants recommend at least 10 years. In addition a copy of one’s return should be kept PERMANENTLY. Many of us also recommend that proof of payment be kept permanently – this would be anything you received which showed withholding and copies of any payments for the taxes – IRS, state, and local – I would say checks – front and back – but I know many people pay their taxes electronically. By keeping the return and proof of payment permanently one can always prove that the tax was paid. Yes, there is a 3 year cutoff for IRS, etc to question one, but if the tax department decides that it never received your return – they can come after you forever. Our state has had several amnesty programs and clients received notices that returns had not been filed or paid even though they had been – one client was my husband’s business and I knew positively that we had filed and paid the return. When I questioned when they were coming after clients who they were only saying had not paid, they said that they had timely started the investigation and therefore the statute of limitations did not apply. Since then I always recommend that a copy of the return and proof of payment be kept permanently. But – one does not have to save their papers as papers. I keep last year’s tax forms printed to be able to use when preparing this year’s return. When I prepare this year’s return I scan it and all relevant notes, etc into my computer, along with the proof of payments and shred last year’s. This is a great idea! I usually keep a current year folder and a next year folder handy as I work current year taxes (just manila, not cute like the writer’s binder!) As I receive documents I write the doc on next year’s folder and then check them off as they arrive the next year. Having a Doh! moment right now because obviously the writer’s checklist that can be referenced instead of re-copied makes much more sense! 🙂 Thanks for the tip!